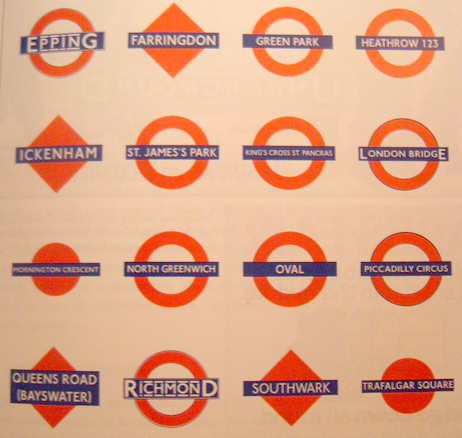 Today sees the launch of an exhibition dedicated to 100 years of the Tube Roundel or the London Underground logo, one of the world's most distinctive symbols. It's amazing to think that something so simple is still one of the world's most recognisable images and has led to so many other subway & transport systems copying or being influenced by it. 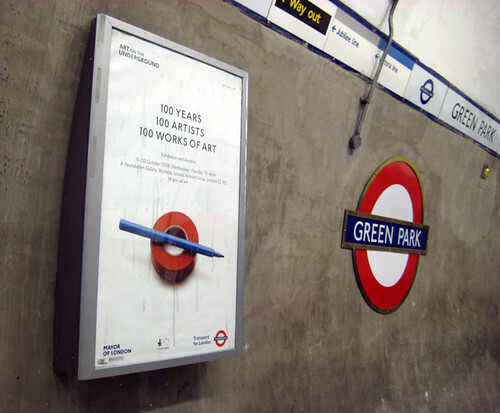 You've probably seen posters for the exhibition, like the one above at the rather naked looking Green Park Tube station, across the London Underground. 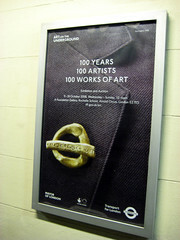 "Reflecting upon a tradition initiated by Frank Pick in the 1920s and 30s, the project presents a unique collection of works that will be permanently archived at London Underground after a public exhibition in October. The exhibition, which will open at Rochelle School, Shoreditch on 9 October 2008, will present a contemporary vision of one of the world’s most recognised brands. The artists involved interpret what the ‘logo for London’ means to them today, employing the Roundel as a symbolic element of their works as opposed to its more frequent use as a branding mark". 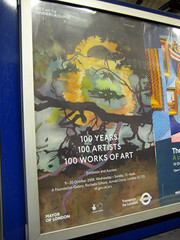 You can see all on display for three weeks in the East End and a selection will be dotted around the Tube itself. The Exhibition runs from the 9 - 30 October, from Wednesday - Sunday each week at 12:00 - 18:00. Eventually all 100 will be online. 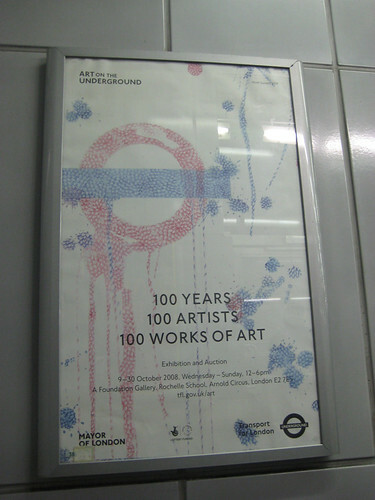 It's great to see these new looks at the Roundel and as I work walking distance from the exhibit, I'll be popping along to take a look soon. Although as the District Line has been so awful lately I've been able to spend plenty of time at Turnham Green Station studying the ones there. Going back to the rather naked looking Green Park station, if you been reading the comments in my post about the new Shepherd's Bush Tube Station on the Central Line, you'd have seen some discussion on the replacement of the earlier tiles. 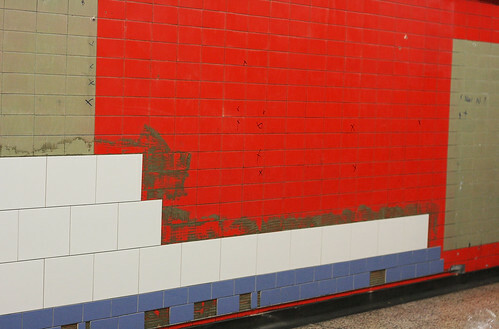 I appear to be one of the few people who liked the old green & cream tiles at Shepherd's Bush and think it's a shame they were all taken down to be replaced by white ones. 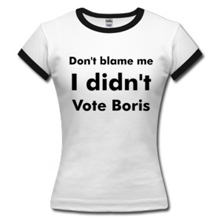 However, I think more people will be with me on the refurbishment taking place at Green Park London Underground station. 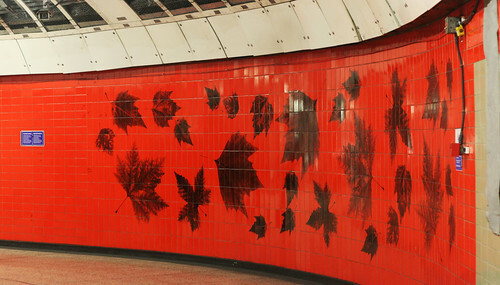 The distinctive colourful leafy tiles there are being covered over by plain white ones. Bloo Phoenix took the pictures above and said: "It makes me sad too. The only hope is that they're being tiled over (just like the posters! ), so maybe one day they'll find them during another "refurbishment" and wonder what the heck those idiots in 2008 were thinking." It's a great point and I'd be interested in your thoughts on this.